This cookbook will create an example cluster with two PostgreSQL servers (primary/standby) and configure streaming replication using repmgr. For platform compatibility with the latest versions of postgres, this cookbook uses the PostgreSQL Development Group (PGDG) packages. Once Postgres clustering has been configured, this cookbook will also create an additional server running pgpool-II. 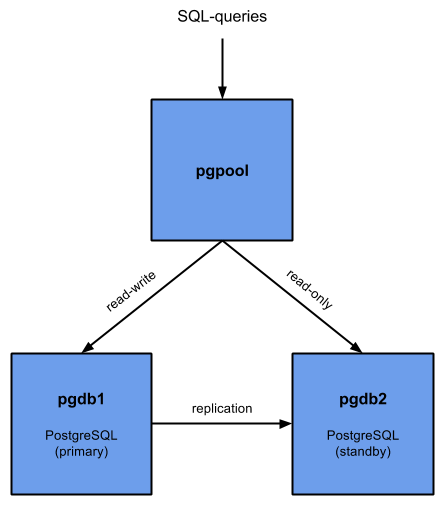 Pgpool is configured to act as both a proxy (it accepts postgres connections and routes them to the correct backend host) as well as a failover controller. Failover scripts have been implemented which allow pgpool to trigger a failover and recover a former primary as a standby node. It was tested on RHEL 7.1 and Ubuntu 14.04 using the Postgres PGDG 9.4 packages. Credit to this article by Jens Depuydt for the detailed setup description, which I turned into cookbook form. Nov 24 23:06:04 ip-33-33-33-181 pgpool: start triggering follow command.